NYC NJ Bed Bug Heat Treatment Guaranteed = No More Bed Bugs! ONE Day = NO MORE BED BUGS!!! Is your business or home is suffering from a bed bug infestation, and you’re suffering from bed bug bites and just want to know How to Get Rid of NJ Bed Bugs? If you contact your local BedBug Chasers today you can be Rid of Bed Bugs Tomorrow! BedBug Chasers Invented its Bed Bug Heater and the “ONE & DONE” NJ NYC Bed Bug Heat Treatment process – NO OTHER COMPANY CAN MAKE THAT CLAIM! BedBug Chasers is the Best of the Best in NJ bed bug heat treatments! Only with BedBug Chasers will you also get a report about what was encountered, the temperatures that were reached and the measures taken to knock out and stop your bed bug bites. If you want to know How to Get Rid of NJ Bed Bugs then BedBug Chasers is the best bed bugs exterminators with the best NJ bed bug heat treatment! If you think you have bed bugs, it’s critical to contact them NOW and find out if those are Bed Bugs Bites!!! As the alternative to traditional pest control services, BedBug Chasers has revolutionized the fight against bed bugs using green, chemical-free convective heat to kill every bed bug, nymph and egg with a single treatment. Unlike typical pest control professionals who rely on traditional marketing methods and word-of-mouth advertising, BedBug Chasers’ unique marketing model allows us to place your privacy first. We liken ourselves to a Health Care Franchise because all our Team members are sworn to a Hippocratic Oath just like regular Doctors. Our Team arrives in unmarked vehicles, and our equipment and uniforms display no logos—we don’t even carry business cards! We are experts in discretion—your neighbors will never know why we’re there unless you want them too. BedBug Chasers of NJ and NYC are your Bed Bug High-Rise Experts, whether it’s uptown or downtown Manhattan, the Jersey City waterfront, the cliffs of Englewood or Westchester County – Plain and Simple: We are the Big Dogs of bed bug removal, bed bug control and bed bug treatment because our single focus since the day we put drafting pencil to paper and opened our doors has been obliteration of bed bugs. Don’t be fooled by imitators that are trying to cash in on the bed bug epidemic or those using less effective electric heaters or sometimes dangerous propane heating equipment. 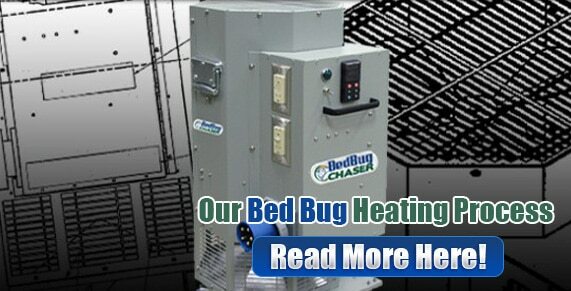 BedBug Chasers of NJ & NYC uses only ISO 9001 certified equipment in our bed bug heat treatment process. Our BedBug Chaser heating units produce an astounding 68,288 BTU’s each and with airflow at 3000 CFM, they turn an infested area into a supercharged convection oven, killing all bed bugs instantly. Our BedBug Chaser heater produces 185% more heat and moves 50% more hot air than our bed bug removal competitors using Thermal Remediation’s EBB-460 Electric heaters. There’s minimal preparation, and you can return to your home or business immediately and with their 15% off your NJ Bed Bug Heat Treatment the time is NOW to call BedBug Chasers!